From number 0300 200 3972 - This is an automated message claiming to be HMRC. The message states that there is a fraud case against your name and to press 1 to speak to them. It further states that if you do not press 1 then a warrant would be issued against your name etc etc. Hang up and do nothing or better still don't answer the phone if this number shows up. Pain Concern believes many patients with chronic pain, as well as their health care professionals, will massively benefit from awareness of this tool. A further Pain Educational Tool has been developed by Professor Sally Curtis and members of this group. see PET tab above. We have been asked by St Andrews to remind you that the only dogs allowed on church premises are assistance dogs or those whose owners have asked for, and been given, permission by the church. Don't forget our new Tuesday Craft Sessions, dates on the right. March 2019 ramblings from the "Doc"
It’s hard to believe that the group had been going for 14 years! I hope that everyone else feels as I do; that the group has grown in strength and that it really does serve as a source of support and friendship. We had a lovely afternoon hearing about the work of Police Community Support Officers Louise and John who work in the Bevois Valley and Northam areas of our city. They see their role as one of helping people who get into difficulties, filling the gap between police and social services. They were lovely, friendly, approachable people who obviously loved their jobs, It’s so good to know that there are such people out there looking out for us and our safety. Our 14th Birthday Cake made by the lovely "Doc"
February 2019 ramblings from the "Doc"
January 2019 ramblings from the "Doc"
We had an open, sharing meeting. We discussed many things including suggestions for this year's activities. These were wide ranging and included psychology, benefits, police, fibromyalgia, carers and laughing yoga! Joan has made a start on many of these topics and we want to thank her for all her hard work in producing yet another varied programme. December 2018 ramblings from the "Doc"
Another great Christmas party with generous donations of food to share. We raffled a lovely Christmas cake made by Sue E and raised over £30 pounds for our funds. Thanks to Mike for our annual quiz and well done to our worthy winners. (I somehow found myself on that team but spent the whole time marvelling at my ignorance and contributing nothing!). November 2018 ramblings from the "Doc"
Next month is our Christmas party and annual quiz. Please bring a wrapped Secret Santa present to the value of £1 (specify on the label if it is gender specific) and donations to the food table will be gratefully received. October 2018 ramblings from the "Doc"
Dr Gina Ingalls visited today and talked about the role of a psychologist in a pain team. She told us of the importance of understanding our pain cycles and how small changes in behaviour can have a large impact on our pain experience. Self care is important and we should do our best to eat well, get adequate rest and sleep, and exercise gently. Activities that you enjoy, feed your soul. She also suggested we all make ourselves a self soothing box. Fill a box with items to which your senses respond positively. Aim to stimulate all the senses pleasantly: touch, taste, smell, sound and sight. Keep the box handy and get it out and enjoy its contents at times of difficulty. For example when your pain is so bad you don't know what to do with yourself and your emotions are really kicking in. Next month we are having a cake sale to raise money for our funds. Please bring cakes and/or money to buy. September 2018 ramblings from the "Doc"
We were treated once more to a calming yet educational session by our friend, and yogi, Fran Hodgson. She gave a really clear explanation about the role of the 7 major chakras and how important it is to our wellbeing for them to be balanced. She explained their individual association to our various senses including sight, touch and sound and also their role in the pain response. The excellent handout she wrote can be downloaded using this link. She encouraged us all to fill our houses with vibrant colour and beautiful smells! August 2018 ramblings from the "Doc"
A fun afternoon with good company and a cream tea. Eight excellent entries to our scone competition ably judged by David and Pamela. Joan was the delighted winner. I've got a horrible feeling that she currently holds the trophies for both sweet and savoury. Something has to be done about that! July 2018 ramblings from the "Doc"
Probably the hottest I've known the church hall! And we gave an equally warm welcome to Dr Adam Geraghty who is a senior research fellow in primary care and population studies. He discussed person-based approach to research; the importance of involving users right at the start of planning research into interventions. He was particularly interested in hearing about our experiences with GPs, issues perceived as barriers, how we manage our condition after pain management programmes and what do we generally find most helpful. We also met Omer Kuroglu an MSc student who is developing an app using aspects of the work done by Dr Sally Curtis and members of this group on Chronic Pain and Loss. We will be hearing more from him as he is looking for volunteers for a focus group to help him design the look of the app. I hope you are all practising scone baking for the next meeting and "scone off"
A very big thank you to Tracey for an excellent session today. As ever, so creative. Never before have I experienced an art session soooo peaceful with everyone concentrating so hard! A few pics from today’s art session. So colourful and almost 3D, especially that ??! 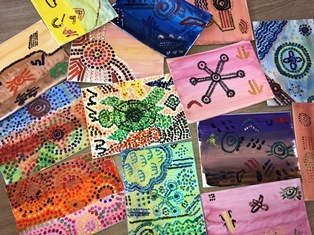 Stories within each piece of Aboriginal dot art. Also below is a photograph of Sue reading Kevin’s article in this month’s British Pain Society publication. Lydia Colmer from the Stroke Association gave us an informative talk on Stroke Awareness. Her main message to lead a healthy as possible life and to be Stroke aware which includes the acronym FAST. Seek medical treatment promptly, early intervention reduces damage and saves lives. Next month brings the boat trip (morning & afternoon trips)on local waters.There are still several places free for the morning session. If interested please contact Kevin B. We look forward to seeing photographic evidence of their water antics. Many thanks to Chris & Steve for organising this event. Coffee session as per usual on June 4th at Coffee #1; Craft session on June 12th - cards & lanyard making; Group meeting on June 21st which will be an art session with our resident artist Tracey. April 2018 ramblings from the "Doc"
Finally some spring sunshine! A good turn out rewarded by a fascinating talk from Dr Becky Peacock about the role of women on the railways. She talked all about the amazing job that women did keeping the trains running during both world wars while the men were away fighting and consequently their significant contribution to the war effort. It was sad to hear what little recognition they got for their efforts particularly when the men returned and wanted their jobs back. Not surprisingly the inequality of the genders in the work force continues in today’s railways. March 2018 ramblings from the "Doc"
Our 13th Birthday and what remarkably well behaved teenagers we are! Much cake was eaten. Kevin B gave us a talk on social media for those of us who are luddites and dinosaurs. I’m not sure he convinced many to sign up to the delights of Facebook, Twitter or Instagram. However, we are grateful that he continues to give Keeping Pace a presence on them if we are to attract new, younger members to the group. Phil reminded us of his Phd looking into the use of virtual reality as a distraction for those living with chronic pain. He is recruiting volunteers to take part in a study. Do contact us if this is of interest to you. 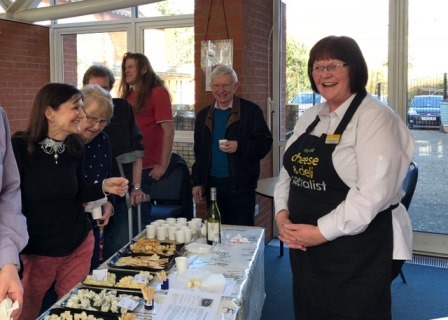 February 2018 ramblings from the "Doc"
We had a lovely session today- Sandra from Waitrose returned to give us another cheese and wine tasting experience. And yes, this time there was wine! She went with a Valentine’s theme picking cheeses from romantic Italy: Pecorino, Dolcelatte, Teleggio and Mozzarella. The most romantic touch was the chance to win a heart shaped Godminster mature organic cheddar from England. We also got a top tip. Teleggio is a great cheese for savoury scones! Roll on November. January 2018 ramblings from the "Doc"
December ramblings from the "Doc"
It was lovely to celebrate Christmas with the group. A relaxed, warm, friendly atmosphere. We were somewhat challenged by Mike’s excellent quiz. Brilliant quiz master, somewhat dim contestants but huge fun! Here’s to 2018! November ramblings from the "Doc"
A very useful session for our group today. Jane Gleeson of www.carersinsouthampton.co.uk told us all about this service which is available to help anyone giving their time, unpaid, to look after a family, friend or neighbour. They also provide Carers Cards which recognise the caring role and can save money whilst out and about. It is vital that carers are encouraged to look after their own health and wellbeing. We also welcomed back Sally Curtis, a long standing friend and supporter of our group. She, and several of our members, were involved in a research project about the parallels in living with chronic pain and the stages of grief. They went on to develop an interactive tool and booklet. Sally came with the exciting news that the project had been written up and published in the prestigious British Journal of Pain. There is no stopping Sally. Her next plan is to try to develop the tool into an NHS approved app so watch this space! Next month is our Christmas party. Don’t forget your £1 Secret Santa present and contributions to the festive table. October ramblings from the "Doc"
Last minute change in speaker arrangements meant that we spent a useful hour discussing the results of our recent survey into evening social events and other stuff. The simplest conclusion was that an occasional evening event, with plenty of notice and good parking, would be appreciated maybe once every couple of months. The day of the week and type of event was less important than ease of transport. The plan was to discuss in January a possible date in March. So please put your thinking caps on about what and where. We also noted that the majority of our members were aged 35+ and if we wished to attract some younger members we might need to embrace social media to advertise our existence. There is some reticence about this in part due to our fear of the unknown. Kevin has promised a presentation about Facebook, Twitter and other such things in the New Year. Next month is our savoury scone competition so get baking and see of we can knock Joan off her perch!!! September ramblings from the "Doc"
Another brilliant session with Fran. It was her 8th visit to us and she always brings something new and inspiring. We prepared for the time together with a practice of abdominal breathing and limbering arm moves to open the chest. We then explored Pranava, the sound of OM, and how it relates to the 4 states of consciousness. We continued with sounding OM and singing. I think everyone went away with something new to contemplate and maybe even practice. I was struck by the importance of self respect and being kind to oneself. August ramblings from the "Doc"
July ramblings from the "Doc"
This month we had an open meeting; topics ranged from scones to virtual reality! Steve Beale had useful information about the T switch on hearing aids and personal loop systems. Chris and Jan displayed and sold hand crafted cards. We discussed the pros and cons of the monthly evening meet-up. Opinions were so varied that I will design a questionnaire and collate as many ideas as possible to bring back for further discussion. Phil, the PhD student from Portsmouth who has befriended the group, told us briefly about the potential of using virtual reality as a strategy for pain management. He has promised to bring examples and tell us more next month. His talk has been nicknamed “Introduction to Phil’s World”! Kevin Bowers wants to drag us into the 21st century encouraging us to use a wider variety of social media platforms. He has promised to set up a demonstration using a lap top and projector screen. The subject of trips came up: Jan will organise a group to attend a Christmas concert that she really enjoyed last year, Steve is hoping to organise some boat trips for next year and Joan is going to look into a visit to Hillier’s Arboretum. I promised to think about how to display all this type of information on a calendar for display at each meeting. June ramblings from the "Doc"
May ramblings from the "Doc"
A lovely afternoon spent water colouring under the excellent tutelage of Tracey Spice. We've never know the group so calm and contented. They even had to be forced to stop for a tea break!! 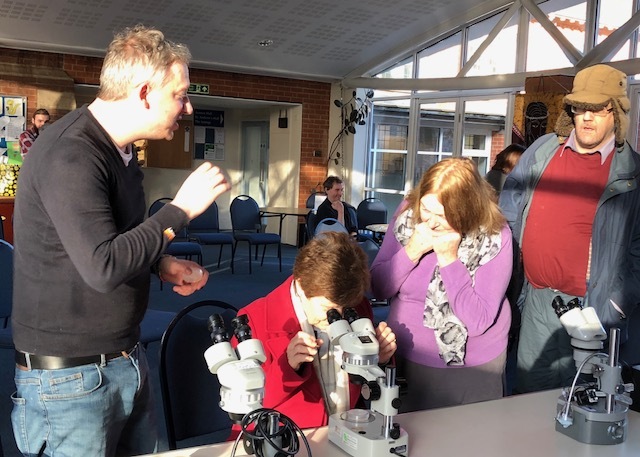 April ramblings from the "Doc"
We were all captivated by an excellent presentation from Dr Cathy Linaker from the Centre for Musculoskeletal Health and Work. http://www.mrc.soton.ac.uk/cmhw She gave us a comprehensive run down of occupational health from the dangers of chimney sweeping in Victorian times, through asbestosis in the 1950’s/’60’s to the current issues of chronic pain in the ageing workforce. 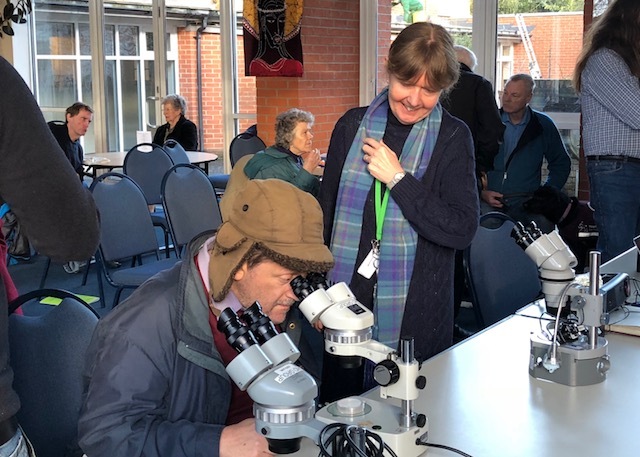 The government has awarded a significant grant to the CMHW to study all aspects of health in an older workforce in order to find ways to facilitate people's ability and satisfaction with working to a greater age despite increasing age and consequent health issues. Some of our group are already involved in aspects of the studies and Cathy promises to return with a progress report next year. March ramblings from the "Doc"
A fascinating and thought provoking meeting hearing about what it’s like to live in a slum in Africa. Sheena, assisted by her mother Ann, told us about the Pamoja Charity that she and her husband founded in Kenya. Among other things it seeks to educate children in the hope that it will give them the skills to rise above the poverty line. More information is available at pamojacharity.org. It was also our 12th birthday. Amazing that we have been going for so long! Lovely that our traditional, yearly, group photo reflected our growth with an array of faces old and new, both in age and membership!! Long may it continue. February ramblings from the "Doc"
I never come away from our meetings without learning something but I never expected to be educated about cheese! 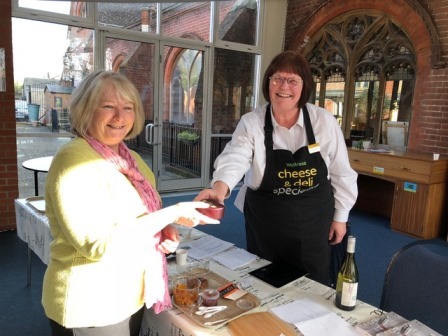 We were so fortunate to have Sandra from our local Waitrose come and give us a cheese tasting experience. How generous of Waitrose and Sandra and what a lovely afternoon we had. January ramblings from the "Doc"
Well what a way to start 2017. A jam packed meeting with several speakers and numerous members. Wonderful to see so many old and new faces. A good reminder of the importance of Keeping Pace not having an annual membership fee so everyone is welcome to turn up whenever, even if they haven’t been for a while. We heard first from Liz James who is a researcher into chronic health conditions. Some members have already helped her through attending focus groups to inform the design of a questionnaire to find out more about the support mechanisms people use to manage their chronic conditions. They have coined the phrase “Collective Efficacy” to define this phenomenon. The resultant questionnaire currently contains an unwieldy 62 questions! So the next stage is to hone this to a core of 15-20. She handed out packs containing these 62 questions and is asking for our help to score them to help identify the most pertinent ones. If you weren’t at the meeting but would like to help, she can be contacted on e.p.james@soton.ac.uk We welcomed Paul Dumper to the group. He wanted to share his personal, positive experience of a relatively new treatment Physiokey Therapy which uses a bioregulating neurostimulator to stimulate the body’s own healing potential. He explained how that, although it hasn’t cured his ME and Fibromyalgia, is has significantly improved it to such a level that he has chosen to study this further and become a therapist himself. More information can be found arcwellbeing.com Then we were treated to an update from Steve about the wonderful Yogi and his well deserved retirement from being a hearing dog. The good news was that they have been given a new hearing dog called Jemma. She’s a large, bouncy, black labrador. A completely different personality to Yogi but Steve is confident that she is going to excel with her training and become a huge help to him. Another splendid party. We even survived without Joan (on a cruise to the Caribbean don’t you know!!) ’s legendary firm hand and supervision! Amazing food, thanks to everyone’s kind donations, and an enjoyable, not too taxing, Christmas quiz to keep us amused. Not to mention the wonderful company. We shared a really useful time with Sally Ann Belward, a physio who specialises in Falls. She explained at great depth the causes and consequences of falls. This was followed by lots of constructive advice on how best to minimise and avoid trip hazards. She spoke so much common sense. We learnt that we all could, and should, do many simple things to minimise the risks. Doctor Dominic Aldington, a consultant who specialises in pain medicine, gave us a very helpful explanation and review of the current thinking in pain management. He reminded us of the physical, social and mental consequences of living with pain. All of these are familiar to the group and it was good to hear them verbalised and acknowledged. He talked about treatment options and how poorly current medication deals with the issues. He emphasised the importance of self management and how necessary support is to those who live with pain. I felt this to be a confirmation of the vital role that Keeping Pace with all its wonderful members has in coping with this rotten condition. Don’t forget to get baking those savoury scones for our November meeting. Will Sylvia maintain her crown? A beautiful September afternoon heralded this month's meeting. As the old adage goes "if you want something done, ask a busy person to do it" and Tracey fits the bill! The Jelly didn't set ? ?, so Tracey being Tracey, she quickly improvised. Jelly printing developed into glass and leaf printing which is similar to mono printing. This technique followed a similar process to the using jelly. As you can see from the photos below some lovely works of art was produced. Tracey also found the time to produce a beautiful gluten and dairy free banana cake, which was devoured quickly. And she also produced the latest edition of the newsletter. Phew, it's exhausting just writing about it! Thank you Tracey. Many thanks also to Kevin our unsung hero, for printing the newsletter. ?? Our first social evening will be held at the Trago Lounge, 192 Portswood Road, Portswood on Friday September 23rd at 7pm. If you are free, why not come along and enjoy a chat, or even something to eat or all! And finally, we missed you Norma, get well soon. Another well attended cream tea; splendid summer weather with an opportunity to have a general chit chat and, for those who wanted, a chance to experience some Reki. 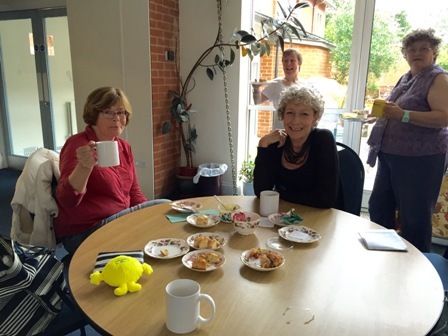 The annual scone competition was judged by our visiting, self appointed experts, Liz Palmer and Cynthia Swan. They took it very seriously. They had done their research and applied criteria such as colour, texture, breakability, straightness etc. Each scone batch received individual comment, praise or otherwise, with no punches spared. Someone, who will be nameless (although I blame it on her Scottish heritage! ), had her scones described as "claggy." I think she's still in shock. Whatever their "judged" quality, the remarkable thing was that they all served as a delicious base for lashings of clotted cream and jam and ALL got eaten. And the worthy winner? The one and only, remarkable, Tracey. Her name is on the trophy so often that we might just have to let her keep it and challenge everyone to rock cakes next time. Mind you, I'm suspicious that some people thought that was what they were supposed to be baking this year so should be well practiced! A really warm (not just the weather) and inspiring open meeting. It was good to hear from other members of the group and great that so many people wanted to share the activities that they use to help manage their everyday lives living with pain. Tracey ran the meeting and told us how Aloe Vera products had so helped her pain and stiffness associated with colitis that she has started a business selling it. Hilary shared her wonderful art, a talent that she has rediscovered since pain prevented her working and how therapeutic she finds it. Joan took up singing to help get her over a difficult stage in her life. Neri advocated exercise and volunteering in her church. Kevin recommended a loving pet and amateur dramatics. He has even trained his dog to be a PAT (Pets as Therapy) dog. I’m proud to be a member of such a talented and dynamic group! We heard from Hannah a student from the University of Southampton. She is completing her Masters Degree into people’s perspectives of placebos and is keen for volunteers with back pain and/or depression to fill in a brief online questionnaire. If you are willing to help she can be contacted on hdb1g15@soton.ac.uk Next month is our “Scone off” which involves volunteer scone bakers, whose efforts will be entered into our friendly competition, and the arduous task of eating the results! June ramblings from the "Doc's Standin"
As always it was a pleasure to have Fran attend one of our sessions. She is one of the most inspiring people I've ever met and she manages to bring something different each time she comes. This time we had some yoga moves, some speaking and of course the obligatory songs. How she manages to get everyone to join in, especially with the singing, is something I've still not worked out. That she does it is a testament to the magnetism that she projects and the engagement she has with everyone in the room. It was also a great opportunity for me to control the meeting, even if I was in second place to the brief participation of England in the Euro 2016 football tournament. It was with a sense of trepidation that I stood in front of everyone ready to do the introductions but I knew I was among friends which made things easier. The power the group gives me, the sense of belonging and the feeling that we share a problem even though we experience it differently, is a huge thing that I thank you all for. Chris and I have now showed that we can all play a part in the meetings, and even lead them. This could lead to a wider range of speakers with even more diverse topics as we become more involved in a group we all get so much benefit from. We were very pleased to welcome Mike Layton who came to today’s meeting to tell us all about Freemasonry especially as it was the first time that he had given this talk in public. We heard all about their history and organisation, and the work that they do in our local community. He gave us some fascinating insights into how their meetings run, why they have different handshakes and ways of standing, and how they are trying to become a much more open and transparent organisation. I hadn’t appreciated that the reason they had become so secretive in the past was partly due to their persecution by Hitler during the Second World War which had led to 1/4 million Masons dying in the Holocaust. It struck me how easy it is to focus on our preconceived ideas of secrecy and ritual and miss the fact that this is an amazing organisation that does so much good with very little acknowledgement. We are particularly grateful to them for the grant that they have awarded us to help cover our running costs. 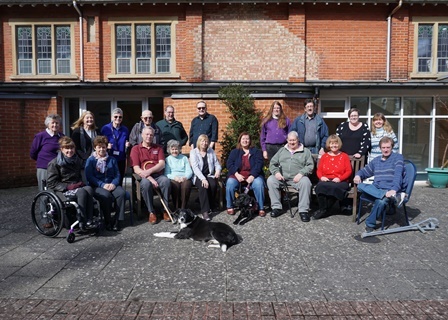 Lise asked the group for help with a fundraising event for her Capable Creatures Organisation that helps people with mental health conditions train their dogs to be their 'Guides for the Mind' Assistance Dogs. www.capablecreatures.org She is holding a cake sale on Saturday July 23rd at the Third Age Centre, 11 Cranbury Terrace, SO14 0LH. She is asking if any of our members who are keen bakers could help. If you are willing to make something for her please let Lise know so that she has an idea of quantities. Ros is very keen to start a walking group. She was thinking of a monthly outing on a Wednesday afternoon. A gentle stroll along paths accessible to wheelchairs etc. If anyone is interested in getting involved please let Ros know. If you are a driver and can help with transport, that would be an added bonus. It was lovely to welcome back Janet, one of our members. She can no longer make it to most of our meetings because she’s so busy with her new and successful dog minding business. Thankfully she found time to come and tell us all about it. She told us many amusing stories about the dogs, their antics and habits, and how she entertains them during their stay with her. There is obviously never a dull moment in her house. An 'odds and sods' sort of meeting today which was actually very pleasant. It gave us lots of opportunities to chat to old friends, welcome new members and eat cake! We revisited and reinforced our ground rules which can be found with this link (Pretty, Please Kevin! ), started our planning and arranging car sharing for the group outing to Furzey Garden on Tuesday April 26th and updated our data base. So all very necessary and useful stuff. We are pleased to announce that we are the lucky recipients of the Waitrose community fund again and picked up the generous cheque last week. 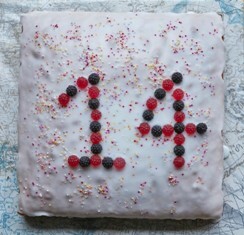 Next month is our 11th birthday so do come along to help us celebrate and eat more cake! A bumper turn out and an action packed meeting. What a great start to 2016. We welcomed Road Policing Sergeant Rik Grant to our meeting. He led a very good question and answer session about the new rules of the use of drugs and driving. He left us feeling reassured that if we are taking our prescription drugs as prescribed, regardless of their strength, and feel that our driving is not impaired then we have nothing to worry about. However, if we have any doubts about our ability to drive, then we shouldn’t. A very enjoyable Christmas party once again. A great quiz from Mike and a bunch of noble winners. We even had a visit from Father Christmas to hand out our Secret Santa gifts. Special thanks to our visiting pianist Cynthia who accompanied us in the singing of a few carols. What made the occasion even more special was the fact that we were able to announce a fantastic piece of news. 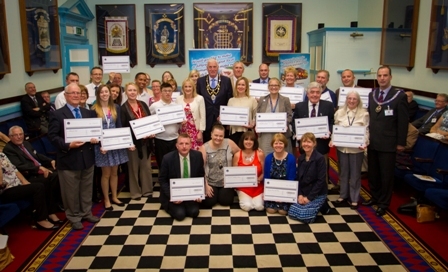 We have been the fortunate recipients of very generous donations from the Hampshire & Isle of Wight Masonic Grand Charity, through the help of the Masonic Lodge in Totton, and also from our local Masonic Lodge, Ye Olde Bargate Lodge. These funds will enable us to pay the overheads so that we can continue to run our support group and hold our regular monthly meetings. The Masons have agreed to come and talk to the group in the Thursday meeting on February 18th to tell us all about their organisation and all the amazing help they give to local causes. Do try and make the meeting as it would be great to have a good turn out for them. We were so fortunate today to have the company of students from the Occupation Therapy Department of the University of Southampton. Not only did they generously give us their time but also provided much of the materials to run 3 separate craft sessions: Christmas Wreaths, Printing, and Glass and Pebble Painting. They even found time to bake scones and came second in the savoury scone contest. What an absolute pleasure to share the afternoon with them. The scone competition was hotly contested and ably judged by our guest visitor Sue and in-house expert Maureen. The worthy winner was our lovely Sylvia who couldn’t quite believe her ears when her name was called out. Next month is our Christmas party so please don’t forget a plate of food to share and a Secret Santa present to the value of £1. Just look at this lot, worthy of the WI..............he he! We had the largest turn out yet to our craft session. These are run 1-3pm on the second Tuesday of the month. I thought I'd share a photo or two to encourage you all to come and get involved. Another enchanting session with our friend and regular visitor Fran Hodgson. She led us through some relaxation and meditation techniques emphasising the importance of balancing our right and left sides and the power of positive action. She recommended a book called Yoga Nigra by Richard Miller. We have organised our Christmas Meal for November 26th. For more information and final bookings please see me at the next meeting on October 15th when I will be collecting your money and confirming your food choices. More thanks to Dorothy for supplying lots and lots of clotted cream and Tracey for making homemade jam. A further thanks to Martine who not only collected and dried lavender but also led the Tuesday craft session in making sachets and pockets to stuff. These were offered to the group in exchange for donations to help fund another outing to Furzey Gardens. Joan is currently trying to firm up the date for the trip so watch this space. We had a return visit from David Barlow this month. This time he came with loads of professional photographic gear to give ideas as to how we can take good picture using even the most basic pocket camera. We were also grateful that it was his birthday because we all got to share the fabulous, huge birthday cake that Joan baked for the occasion. And on the subject of food - next month is the annual scone baking competition! Please remember to bring your best efforts to be judged and enjoyed. The more entrants we have, the more scones we can all eat. So everyone’s the winner! 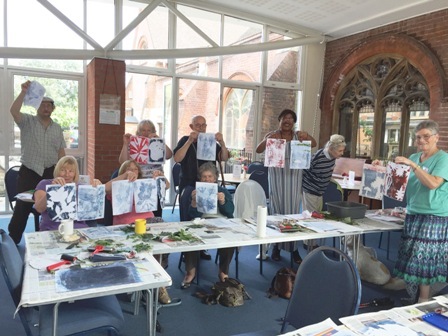 Tracey Spice, our wonderful, resident artist and magazine writer, treated us to another silk painting session. 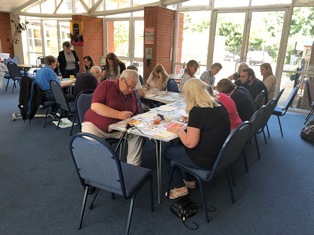 It was a lovely afternoon and even those who didn’t paint enjoyed watching the various creations that were made. We welcomed Steve Smith to our meeting today. He is passionate about Mindfulness as a useful strategy to help people who live with persistent pain. He has found it so effective in his own life that he gave up his previous career to train in the technique and now teaches it. He gave us a taster today. For more information please see attached information sheet. A big thank you to Chris Matcham who came at short notice to give us a fascinating talk about hedgehogs. Chris dedicates a large amount of time attracting these amazing little mammals into his garden. He gave us lots of information about the likes and loves of these creature and how, with some minor alterations mainly to do with access, we too could encourage and help these animals. He also volunteers at the Hart Wildlife rescue Centre http://www.hartwildlife.org.uk who are happy to give advice and take in, and care for, all kinds of wildlife in Hampshire. Well we had a splendid 10th Birthday Party. Loads of cake and conversation. We played pass the parcel which cunningly included an opportunity to reminisce at each layer of unwrapping. It was good to take the chance to pause and reflect on the last 10 years and to look forward to many more shared moments in the future. Lots to do this meeting. We gave Clare Handley of the Southampton City Clinical Commissioning Group feedback on the GP leaflet about chronic pain. She is still happy to receive more, so if you missed the meeting we can give you her contact details. We were introduced to Sophie, a 4th year medical student, who is taking over from Emily the student we met last year whilst doing the focus group with some of our members about persistent pain and the patient journey. The next stage of the study is to develop a questionnaire based on the themes identified by the focus group. Sophie is interested in getting our help with developing this questionnaire and so will be back for more input. Tracey Spice, one of our members, is part of a group who have called themselves CAKE. They are all women artists with a mission to celebrate women’s creativity and achievements across Southampton on International Women’s Day on March 8th. Do try and catch one of the art exhibitions being held around the city. Next month is our celebration too. Keeping Pace's 10th Birthday. We are going to have a vintage style tea party so do come and join us. We started the New Year by welcoming a new speaker to our group but one who we hope will befriend us and return. His name was Justin Strain and he works in the Pain Clinic at Solent NHS Trust. He gave us a very informative overview of the changes brought about in the benefit system by the migration of Disability Living Allowance to the new Personal Independence Payments. It seems that where the DLA concentrated on how much help a person required as a result of their disability, the PIP focuses more on the level of function of the individual. As with all changes, there seems to be good and bad aspects and some will gain where others might miss out. The important thing is to seek as much help as possible with filling in the forms; friends and family can be quite insightful and there are various guides available on the internet, for example Disability Rights UK. Fill the form in taking account of how you are on your worst days and appeal if you don’t think the decision justified. We were handed out some information which is being used by Clare Handley of the Southampton City Clinical Commissioning Group to compile a fact sheet for patients about the services available to those living with pain in our area. Your expert knowledge is valued so please have a look through it and come to the February meeting with lots of ideas to help with the compilation of this leaflet. The 11am meet-up on the first Monday in February at Coffee#1 was well attended. (And the Hot Chocolate delicious!) It was decided that we will continue to use this venue for the time being. If anyone has a problem with this, do have a word with me at the next meeting. We had a great Christmas Party. Thanks to everyone for coming, contributing Secret Santa presents and food, and generally being special!. Mike outdid himself with an excellent quiz and Jim kindly accompanied us in the singing of a few festive carols. It is thought to be more accessible for those relying on buses. For the drivers there is parking in Mayflower Road for one hour but more parking in Marlborough Road and behind Sainsbury’s. We will give it a 6 month trial and see if it suits. I know some people are going to use it as an excuse to visit the charity shops in Shirley!! So see you all there 11am February 2nd. An enjoyable, action packed meeting! A warm welcome and thank you to students Laura and Hannah of the Occupational Therapy Department of the University of Southampton who led a craft session teaching everyone the joys of iris folding. The students had worked really hard on the preparation and supply of everything needed for us all to get stuck in! (Double sided sticky tape and all!) We are also grateful to Anita and Teresa for arranging the event. We held the annual savoury scone competition hotly contested by 3 hopeful British Bakers. Thank you to our esteemed judges Marilyn Monkhouse and Christopher "I’m only here for the food as my Mother starves me" Barlow. 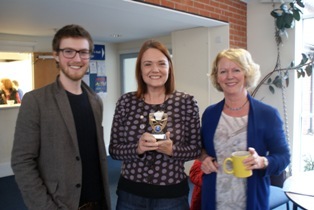 It was no surprise that our resident super cook Tracey once more took first place. Who will beat her? This year I can proudly say that I came in the top 3 as opposed to my usual bottom. Next month’s meeting will be in the form of our Christmas Party. We intend the usual quiz and American supper. Sweet, savoury or soft drink contributions to the food table will be gratefully received. There will be a Secret Santa so please bring a wrapped present to the value of £1 marked as to whether it is suitable for a male/female/child or anyone. See you all there! What a busy meeting! This month's speaker was Pete Moore, author and pioneer of the Pain Toolkit. Pete's talk was not only entertaining but highly motivating. If you don't have a copy of the Pain Toolkit please ask at the next meeting, as we have several copies in the library or it can be downloaded for free from www.paintoolkit.org. Have a look at the "Brainman" clips on the website. Pete is happy to answer questions, contact him through the website. Dr Teresa Job and three of her Occupational Therapy students from the university made a flying visit to ask the group for volunteers for this year's animation project (examples from last years project can be seen on this page). If you are interested please let Norma or Joan know. The students have kindly volunteered to lead a creative session with the group for our November meeting. Which leads me to remind you that November is The Savoury Scone competition, if I can get the trophy off Sue! Why not have a go? I'm sure that everyone is feeling inspired to bake following the Great British Bake Off! Norma will be collecting names and deposits - £5, at the November meeting, for the annual Christmas lunch at Haskins Garden Centre on Monday December 1st. Cobbled together Ramblings by proxy of an absent Doc!! Today's visit from Tash, The 'cat lady', was great. Her name was Tasha Ault and she talked about her own history: of ME, slipped disc & fractured coccyx & the therapies (cat therapy, SCENAR and Cycloidal Massage) she uses in her company. These are an integral part of her journey to find pain relief from her own chronic pain which she felt orthodox treatment and drugs didn't touch. Her cat Mckay was a hit of course, so sweet seeing him do a high five, sit, give a paw, kiss etc just like a dog does. After her talk quite a few people went to speak to her. She said she'd be happy to bring the couches she uses to any meetings for people to see a demonstration and possibly have a taster. We will see how the group feels about this. We also met Clare Handley a manager from NHS Southampton City Clinical Commissioning Group who is pulling resources together for GP's to give to their patients, self-management advice to help them to live with their pain. We are very keen that people are aware of the warm welcome they would have if they chose to attend out group and so we were glad to see her at our meeting. Ros told everyone how the council are taking bus passes away from 1200 disabled people and that she had contact details of someone from UNITE who are helping to challenge this. Chris, Jan and Sue had copies of instructions for Dorset posies which we are going to attempt at the craft session in November. Quilling is planned for October. Jan mentioned she'd met a lady from the last PMP who said a few of them are thinking of coming to the next meeting. Pauline said she'd told her GP about Keeping Pace, the doc had never heard of us and so asked for some information. Pauline took some leaflets in. This sparked a short discussion about GPs, and it was useful that Clare was there because she said every GP now has "target training" & a consultant tells them about the group. A few more people took leaflets to give to their surgeries. 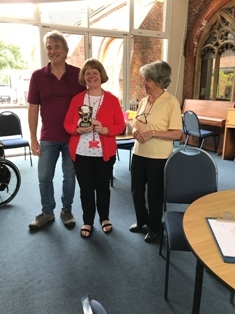 The August meeting brought our annual Cream Teas event and "Scone Off" competition which was keenly fought and gave judges Audrey and Elizabeth a lot to deliberate and chew over. The winner for the 3rd time was our resident artist Tracey. As for the recipe to her success? Tracey keeps this a closely guarded secret! We were also treated to home made bread from Arthur who was testing out a new recipe. Judging by the rapid disappearance of the loaf one must assume that Arthur has found a successful formula. Whilst the scones were being judged, Tracey held a masterclass in water painting which was enjoyed by all of the group. Many thanks to Tracey and her assistant Antonia. The traditional summer "scone-off!" The pictures say it all!! Furzey House and Gardens outing, April 24th 2014. Many thanks to Martin Lenaerts and his wonderful team of volunteers for making it a day to remember. Sam Goold from Healthwatch Southampton came and introduced himself and the organisation he works for. Their remit is to be the voice for patients and public in matters concerning health and social care services in Southampton. They want to help the general public to influence local services and hold them to account using the strength of the law and the national influence of Healthwatch England. We were encouraged to get involved and tell them about our local experience, good or bad, and to give them our ideas for improvements and changes. They can be contacted in various ways at their base in the Voluntary Action Centre in St Mary’s: in person, in writing, by phone or through email. More information is available on their website www.healthwatch.co.uk . I also told the group about some work that I am starting to do with NETSCC ( the National Institute of Health Research Evaluation Trials and Studies Coordination Centre ). This organisation is also interested in getting the general public involved but this time by them suggesting areas of our health that they feel require more research to ensure that the medicine offered in the NHS is evidence based. They have an extensive website with lots more details www.nets.nihr.ac.uk . I hope you are all practicing for the August scone off! I have a feeling this is my year!!!! Today we welcomed Marion Gealer. She and her colleague Paul Hedges run Active Options, a Community Interest Company which they started when the government funding of the original Active Options dried up. 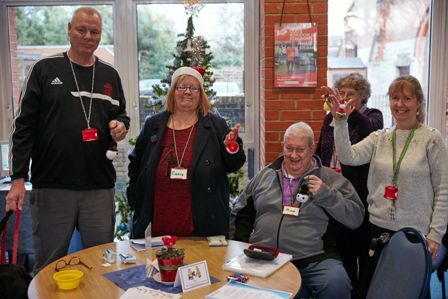 They specialise in bringing ideas for activity and exercises to community groups with particular health needs. She gave us a sample by making us do seated exercises with balls and bands to funky ’70’s music. It was most enjoyable. More information and details of classes in your area can be found on www.activeoptions.co.uk. It was a pleasure to welcome Fran back amongst us for more yoga, breathing, chanting and meditation. This time we attempted nostril breathing and learnt some useful tips - breathing through the right nostril is good for getting going, for example in the morning, and the left nostril for calming, helpful if we are having problems getting to sleep. (We reckoned that the way to remember this was Right for Ready and Left for sLeep!) We sang some beautiful uplifting and relaxing chants. This one in particular reminds us that there are always going to be good and bad days and yet not to dwell on regret, the synonyms of which include guilt, shame, self-accusation etc. We congratulated Jess on her new job as a class room assistant. She will find it difficult to attend future meetings and so we encouraged her to make sure she did what she could to come in school holidays. We will miss her setting our Christmas quiz and might have persuaded her to do us a summer one in August before she goes. Emily, the medical student who is doing research into a patient's pain journey, fed back the result of the focus group which she held in March. She wanted general agreement from the group to validate her findings. One of her main conclusions seems to be that on the whole patients are less concerned about how long they wait to be seen by specialists so long as when they are seen they are treated as individuals and listened to. We celebrated our 9th birthday today with our usual group photo and cake. It was fitting that we also took the opportunity to think of others and had a collection of food items to donate to the Southampton Basics Bank. This is run by Southampton City Mission. It hands out food and clothes to people in need who are referred to the service by social workers, doctors, community workers, churches etc. Vouchers need to be obtained from these referral agents to use the service as there is no direct access. More information can be found on their website www.southamptoncitymission.co.uk/basics-bank. It was humbling to hear stories from two of our members who had had cause to get help from the Basics Bank and what a positive and uplifting experience it was for them. We were revisited by Dr Teresa Job and her students from the Occupational Therapy Department of the University of Southampton. They had been working on animations telling the pain stories of 3 of our group members and came back to show us the completed films. The results are the most amazing and emotionally moving pieces of work. We hope to upload them to our web site for all to see in the near future. I think that everyone has found it to be a rewarding collaboration and the plan is to continue with this valuable exercise. We are grateful to Pauline and Keith for offering more Reiki sessions to those who wanted them. Some stayed behind to participate in a focus group study about the pain journey from diagnosis to treatment with Emily, a medical student from University of Southampton. She is planning to use the information to construct a questionnaire for further research into this topic and will feed back at the next meeting. The Tuesday craft session is being led by Jan who is going to show us how to make small baskets which would be ideal for little Easter eggs. Well there was a lot to learn and take away from this meeting. Steve Beale shared his passion for trying to get Southampton “looped”! In other words encouraging all public buildings such as banks, post offices and hospitals to comply correctly with the law and provide functioning hearing loops for the deaf. In his experience departments who should know better such as those in hospitals who offer services specifically for the deaf eg Ear, Nose and Throat and Audiology are amongst the worst offenders. The charity Hearing Link http://www.hearinglink.org have done a great job “looping” Eastbourne and Chris and Steve are joining forces with other volunteers to “loop” Southampton starting with The General Hospital. The other interesting point to note is that when folks go to get their NHS hearing aids they are not routinely offered ones with the T switch which would enable them to benefit from a hearing loop system. Apparently this is a more time consuming and costly option. The T switch will be added if asked for and Steve was urging us to pass on the message that this option is worth requesting. We than had an illuminating talk from a representative of Options http://www.optionscounselling.co.uk. Alongside a description of their various counselling roles, she informed us about their Optimise Project which is particularly concerned with educating the over 50’s on the matter of sensible drinking limits; how our tolerance to alcohol and its health risks are affected by our age, medical conditions, diet and medication. Members of the group had no problem in illustrating one of her points by demonstrating their inability to estimate and pour a correct unit of alcohol into a glass! Their generous hands measured out closer to 3 units despite thinking it was just 1! So good lessons about the need to manage our alcohol consumption accurately were learnt. Next month is our 9th birthday and we will be celebrating with a very big cake! We are also going to hear from the Southampton Food Bank. We though it would be nice to spread some birthday cheer and give a donation to them. So if anyone has some spare food, preferably tinned or dried, that we can have to make up a box for the Food Bank it will be gratefully received. http://www.southamptoncitymission.co.uk/donations. Finally we have received a letter from a 4th year medical student attached to the Pain Clinic in Southampton which I attach. She is wanting volunteers for a focus group to gain information about the patient journey from onset of pain to seeking and getting help. She will come to our March Monday coffee morning, Tuesday craft session and at the start of the Thursday meeting to explain the project in more detail to those who are interested and intends to hold the actual focus group after the main meeting has finished in the far corner of the room. It is likely to last about 1 hour. We kicked off 2014 with the great news that Joan, on behalf of Keeping Pace, had collected a cheque for over £500 from the Waitrose Community Matters collection in Romsey. Some of this money is going to fund our new initiative - a "Make, share and chat" craft session 1-3.30pm second Tuesday of each month at Avenue St Andrews United Reformed Church. Please feel free to turn up and join in. No booking is required. Bring your own crafts to be getting on with or have a go at the selection of activities which will be on offer. There is no charge for the event but occasionally a contribution towards the cost of materials may be welcomed. Tea and coffee will be provided. There is also a cafe in the main church hall at lunchtimes on Tuesdays and so you could always go there for lunch before getting crafty! We then heard from Lise and Janet. As many of you will know Lise has been training her dog Dahy to be a helper dog. She has been amazed at how this dog has not just provided the practical help she wanted but has also been a great source of physical, mental and psychological benefit to her. She therefore wishes to share this experience with others and is in the process of setting up an organisation called Capable Creatures to this end. She had a questionnaire that she asked members of the group to fill in to help her with market research to inform this fledgling enterprise. For a copy of the questionnaire or further information contact Lise or Janet on lisemarron@btinternet.com or jsusanb@talktalk.net. 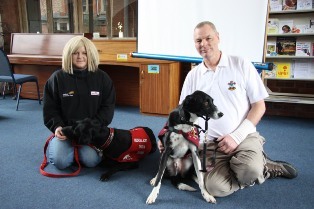 Chris and Steve reinforced the life changing benefits of worker dogs through their experience with their hearing dog Yogi. We were saddened to hear that Yogi is nearing retirement but is likely to be kept as a pet alongside a new hearing dog for Steve. Many in the group collect stamps for the Hearing Dog charity and it was good to hear that they raised £12,500. They also gave some interesting statistics: Hearing Dogs has been going for 31 years, there have been 818 hearing dogs trained in total so far with 59 new partnerships last year, there are 17 dogs working with children and 25 dual purpose for hearing combined with other disabilities, and they replaced 46 dogs due to retirement in 2013. Joan has put together an exciting programme of speakers for 2014 so watch this space. We had a record turn out for our Christmas party which was lovely to see. Everyone seemed in good spirits and the food was abundant. Mike and Jess's combined efforts produced a varied and entertaining quiz which kept us all amused (or possibly bemused if you were on my table!). This year our carol singing was led not just by our capable Jim but also Ian on the drums. Thanks to everyone for their contributions and to Kevin and Sue for their sterling work in the kitchen. This group could not flourish without its amazing members and so I want to take this opportunity to thank everyone for their attendance and support throughout 2013 and am looking forward to spending more quality time with everyone in Keeping Pace in 2014. One of our members Pauline and her colleague Keith came and told us about their recent training in Reiki. They are both now Reiki Masters and generously offered some free treatment sessions to those who wished to try this complementary therapy. Ian and Ken had spent the morning at the Occupational Therapy Department, University of Southampton, working on their animation about living with persistent pain as described in the October Rambling. They had found it a positive collaboration and had appreciated the opportunity to emphasise the individual nature of the pain experience. We look forward to seeing the end result in the New Year. 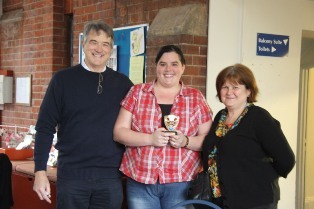 Savoury Scone Winner 2013 - Sue Kelly, again! Next we heard from Dr Teresa Job from the University of Southampton who was looking for volunteers to come to the Department of Occupational Therapy in the Faculty of Health Science to meet the undergraduates and get involved in making an animation about their health experiences. She feels that meeting real people with stories to tell about their medical conditions is an invaluable experience for the students as they will be the health professionals of the future. Joan is collecting the names of anyone interested in getting involved in this project. Next month we have Reiki with Pauline and our savoury scone-off. So budding bakers beware - I have been doing my research by watching The Great British Bake-Off and am confident of not finishing bottom this time. I might have to eat my words (or just my own scones if no one else does)! I am still collecting names, menu choices and deposits for the Haskins Christmas Meal on Monday December 2nd at 12 midday. Please let me know asap as there were already 2 other parties booking for that day. Sadly Fran was unable to attend the meeting today. We wish her and her family well at this time. So instead I cobbled together a quiz for our entertainment which certainly kept us amused even if some of the subject matter was a bit beyond us! It's just good to be together and to share each others company. There was a general agreement to plan a further Christmas Meal at Haskins Garden Centre on Monday December 2nd and I will circulate details nearer the time. The new newsletter is out and it's jammed pack with brilliant stuff. Please all try to do the competition as entries so far have been few and that feature might be dropped. The editors have also asked me to mention that they are currently seeking contributions for the Christmas edition. Another hotly contested "scone-off" which saw Tracey regain her crown as champion baker. In fact she was generally the star of the show as she also led an interesting art session where members experimented with bright colours and collage using Matisse as their source of inspiration. Next month we see the return of Fran Hodgson who always shows us how accessible yoga can be whatever ones health issues. Do come and join us as we invariably have a rewarding time under her tutorage. Ian enjoying his scone and jam. Another informal meeting where we discussed aids and appliances that members found helpful. Janet was very enthusiastic about the various calendar, tablet boxes that you can buy to sort your medication into. Some have removable parts so that a day's worth of tablets can be kept in your bag when you are out and about. Speaking from personal experience, if you are buying more that one week's worth of boxes to stock up at a time make sure that they start on the same day of the week. I discovered that some "weeks" start on a Sunday and some on a Monday. Guaranteed to confuse if you are not careful! Sylvia told us all about a ball in an old stocking contraption that she uses for massage. We felt that a demonstration would be useful so we think we persuaded her to return next time with said gizmo and show us! Arthur had a natty device to help him unlock doors with keys without putting too much strain on his arms. Its called a Key Turner. Purchased for a reasonable price in the mobility aid shop in Shirley (around £4). I also found it online. V shaped pillows were discussed with variable feed back - some found them helpful and some felt they aggravated their pain. Francoise had one that she was willing to pass on to others to try as it hadn't worked for her. Jessica recommended volunteering as a way to try to manage pain and has recently started work at a primary school. We wish her success with that new venture. Next month is art with Tracey and our usual, hotly contested, August scone-off with a trophy up for grabs! See you all there. An enjoyable, sharing meeting. Members set up tables and demonstrated their hobbies and talents inviting others to come, hear and try. There were activities such as card making, wood etching and paper bead creating, and talks about drumming, photography and organic farming to name but a few. What a talented bunch! Ali Bowser from the Research Design Service (RDS) South Central came today determined to make us excited about research! Certainly her enthusiasm was infectious. They run a free service to help researchers submitting applications to the National Institute for Health Research Funding. The part that is relevant to us is that nowadays the institute won't even look at a proposal unless it can be clearly demonstrated that patients have been involved in the planning stages of the project as well as throughout the process and not just be the subjects of the research. This is obviously a very positive development for the interests of patients and one which the group agreed should be encouraged. So Ali was very keen that members of the group felt free to volunteer if she was involved in a research proposal which would benefit from their expertise in living with pain. In fact she already had a research proposal in mind - a study with the acronym POEM concerning pain relief in Accident and Emergency departments. Next month we would like members to bring along their hobbies for a "show and tell session." If you are willing it would be lovely if you can bring some bits and pieces with you to allow others to have a go and learn from you. An interesting meeting. The members were invited to say in one sentence what it is that helps them to live with their persistent pain. The sentences were than typed up and displayed on a screen. The result of this exercise can be seen in this link Sentence The group then decided that this was a good reflection of the general feeling of the members and that others might find it helpful. The challenge is to review the sentences and decide how best to display and circulate them. Some time will be spent on this at the next meeting. If anyone has any ideas that they want to explore before the meeting then please email me on norma@rosiewaite.com. We also spent some time discussing and contributing to a document being prepared for health planning for Southampton, commenting on aspects such as GPs, specialist pain services, social care, and other state and non state provided health services with particular reference to persistent pain. It is good that the group's opinions are being sought on such important matters. Next month we are going to hear about how we can get involved in research. Should be a worthwhile meeting so do come along. Never in a million years would I have believed that we had so many budding cubists in our midst. Tracey Spice has a real talent for making art accessible to even the most reticent and she encouraged us all to have a go at Picasso inspired art with fantastic results. Thank you so much Tracey for your enthusiasm and inspiration. We celebrated our eight birthday with cake and the launch of our new look quarterly magazine. Thanks to Jess, Janet and Kevin for all their work in writing, compiling and producing such an interesting read. (Did anyone else have to resort to the answers to complete the crossword?) If you have not received yours do contact Kevin. The editors want to remind us that the magazine is only as good as its content and so want everyone to contribute to it. The first Monday in April is Easter Monday but as we didn't get around to rearranging the date, there will still be a meeting of those who wish at Haskins for coffee at 11am on April1st. And no, this is not a joke! A meeting very much run by the members. Janet reintroduced the Keeping Pace library. Reminding us of the range of books relating to pain and self help that can be borrowed for a returnable deposit of £5. Pauline, Janet and Tracy then reviewed a selection of books that they had found helpful and would recommend to the group. Pauline's choice was Break Through Pain by Shinzen Young, Janet introduced The Power of Now by Eckhart Tolle, and Tracy chose 2 books: Perceptions of Pain by Deborah Padfield and The Touch of Healing by Jin Shin. Jess then informed us about the new look newsletter, nearly hot off the press and ready for distribution in the near future. Jess and Janet have volunteered to help Kevin with the task of writing and compiling this for us. There is even to be a regular competition and the group agreed on a £5 voucher as a prize to encourage the group members to participate and contribute. Ken talked about the focus group study exploring patients' trust in their GP's which some of our members were involved in last month. It sounded like it had been a very positive experience for all who had been able to attend. There is a possibility of a further focus group on this subject as well as other opportunities to liaise with researchers at the University of Southampton. Do come along to our meetings to hear more. Joan expressed her pleasure that the group members and their collective experience of living with pain is so well recognised and valued. Jim made a suggestion about the group spending a meeting trying to sum up in one sentence their approaches to pain that they find useful. Dorothy immediately supplied us with a brilliant thought that she has a butterfly approach to hers - when in pain she flits from one activity to another, and these can be as simple as doing some colouring in of a picture, for distraction. It immediately conjured up for me a lovely image of colourful butterflies moving from one place to another especially, as to my mind, they do seem to settle down eventually on a beautiful flower. This composing of sentences is to be part of April's meeting. Have a think about what yours might contain. There will be no pressure for people to supply a sentence if they don't want to, sentences can even be contributed anonymously if that is what members want but do come along as it is bound to be a fascinating time. Dr Rose Wiles from the University of Southampton came today to tell us about a fascinating study that is being carried out into how people decide whether to trust their GPs. She explained that trust is very important and might make a difference to health outcomes; if you have trust then you are more likely to comply with the treatment and advice given. Previous research has suggested that patients with long term health conditions show the lowest levels of trust. This is why they are keen to research the topic and particularly to recruit members of our group to participate in a focus group discussion. We spent the rest of the meeting discussing ideas for speakers for the new year. If anyone has any ideas please talk to Joan at the next meeting to let her know. Next month we are planning to reintroduce the library to the group and get some of our members to do book reviews. Do come armed with your favourite book or one that you have found particularly helpful so that you can share it with us all. This month we celebrated Christmas in our usual way. We shared festive food, attempted to show our collective intelligence by doing a quiz and sang christmas carols accompanied on the piano by Jim. A big thanks to all those who contributed to the event with food and particularly to Mike for compiling the quiz. Instead of our secret Santa, many brought in non perishable food for the homeless to the value of £1. 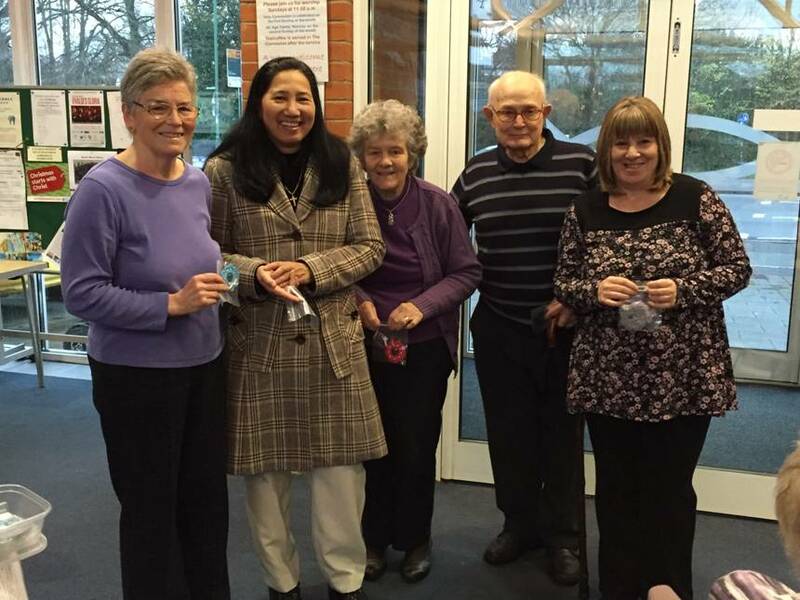 The Southampton City Mission were very grateful when I took them three full carrier bags of goodies. A fun session this month including food and craft. I taught anyone willing the skill of iris folding and we managed to produce a lovely array of Christmas bauble cards. We held our first savoury scone baking competition and were amazed at the variety of flavours, colours and shapes. All perfectly legal according to our judges David and Pat who had researched the subject on the internet before settling down to the serious business of tasting. The worthy winner was Sue Kelly despite the fact that she had never made any type of scone before! The winning recipe came from a cookery book which is being sold to help fund a replacement roof on the church that the Beales attend in Thornhill. If anyone wants a copy then they need to have a word with Steve and Chris. The next meeting on Thursday December 20th is our Christmas party. Mike has agreed to set this year's quiz. Please can members bring contributions of food and drink for the event. We normally hold a Secret Santa but this year it has been suggested that people spend their pound instead on an item of food that can collected together, made into a Christmas box and donated to a charity for the homeless. Kip has agreed to coordinate this for us. We will be meeting at Haskins Garden Centre restaurant as usual on Monday 3rd December but instead of coffee at 11am gathering at 12pm for our Christmas dinner. So far 15 people have given me deposits and their meal choices. If there are any members who wish to be included please contact me via email norma@rosiewaite.com by Thursday November 29th at the latest, with your meal choices, and I will make sure that you are included. The Christmas menu and prices are on the Haskins webpage. We welcomed David Drury to our meeting today who gave us an informative and helpful talk about the Hampshire Bobby Scheme which works through the charity The Blue Lamp Trust. The Bobby Scheme is a practical service whose aim is to make us all safe in our homes. Their fully trained fitters give advice about, and provision of, all aspects of home security including: long-life smoke alarms, appropriate door locks, spy-holes and door chains. Where appropriate they will even make good damage caused by a forced entry. The Bobby fitters are all uniformed and carry ID cards. They will always make an appointment before calling. The service is free of charge. The Bobby Scheme can be contacted using bobby@bluelamptrust.org.uk or by phoning 0300 777 0157. David Drury is himself one of the Bobby fitters and certainly would instil confidence in anyone who asked for his help with their home security. As Web Master, I reminded the Doc to mention the savoury scone off competition planned for our next meeting and the trophy which is up for grabs. However, it seems that she is determined to win (some hope considering her position of bottom in the last competition! ), and so tried to keep quiet about it to minimise the number of entrants. She has heard rumours that some people are taking it very seriously and have been practicing for weeks. Let’s have a clean fight please Doc. Fran Hodgson returned to treat us to another session of yoga and relaxation. This time we explored the therapeutic use of vowel sounds in chanting and once more managed to make a harmonious noise (most of the time). The reward of joining in and forgetting self consciousness really is a sense of calm at the end of the session. I'm sure we all should find time to practice this regularly in our every day life but how soon that thought vanishes once we return to our usual routines. Fortunately Fran has promised to return next year to keep us reminded. Another successful "scone off." 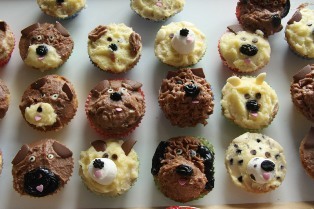 Wondrous selections of scones, homemade jam, cakes and fairy cakes decorated to resemble dog faces. Thanks to all who generously contributed their delicious wares. The judges took the task of selecting the best sweet scone very seriously. They seemed to eat a fair amount between them, all selflessly, in the line of duty (or so they told us). Highly commended came Euan for a particularly light texture, Janet came a close second but the worthy winner was Michele. 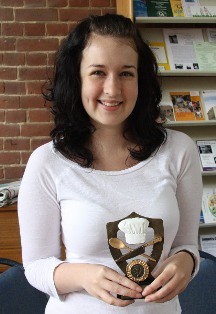 Sally had kindly donated a savoury scone trophy to add to our event but no one chose to make any this time. The group, as always undeterred and keen on food in general, has decided to hold a savoury "scone off" in November. So get practicing. Tracy was unable to do the art session today and so this is also planned for the November meeting. Webmaster note: I'd like to add to the above and thank Pat for all her help in the kitchen, which in the absence of Sue (who is on holiday) was really welcome. Sally Curtis kicked off proceedings this month giving us an update on where she and members of our group have got with the "Chronic Pain Loss and the Future" project. The resulting work has now been printed into a very professional looking leaflet. 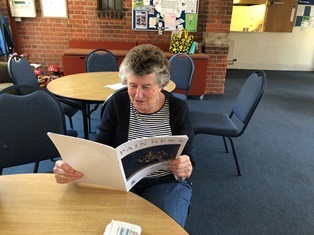 Sally hopes to find other support groups in the area for people with chronic health conditions that also experience pain and get feedback from them as to how useful the booklet and the ideas it contains are. We spent the rest of the time socialising and planning ideas to fill the forthcoming Keeping Pace schedule. August will be our usual cream tea and the hotly contested "scone-off." Tracy will also run an art session. A cunning plan to distract us from eating too many scones! An excellent turnout for a wonderful talk and demonstration of Chi Kung and Tai Chi by Glenda Davies. She is an advanced instructor and showed us how the techniques can be modified to accommodate people's health needs. She emphasised that regular practice can actually improve health. Tracy, one of our members, gave a personal recommendation about the benefits she has experienced since attending Glenda's sessions. Glenda and her associates have a website that is worth checking out http://taichi4healthandwellbeing.com. They run numerous classes throughout our local area. There is a charge for the classes but Glenda generously, and in addition, offers to see people on a one to one basis if they have concerns about their individual health to ensure that they get the most out of the classes. Watching Glenda performing her Tai Chi form was fascinating and a palpable calmness filled the room as she was doing it. This month Dr Tony Snell, medical director of Solent NHS Trust came to tell us about the plans to become an NHS Foundation Trust. This is part of their public consultation on their application. There was quite a lively discussion on wide aspects of health in Solent ranging from the out of hours service to fluoridisation of the water to prevent dental decay. The conversation then came back to the subject in hand with some of those present showing enthusiasm for the chance to become a member of this new foundation trust and thus being able to influence decision making. For more information you can visit the website http://www.solent.nhs.uk or phone 023 8060 8937. This month the members of the group showed their amazing and widespread talents. Several members set up craft tables allowing others to try out new skills. 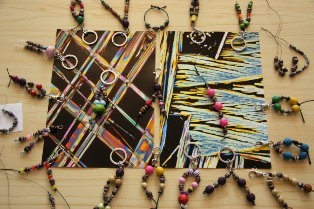 There was jewellery making, box creating, glass engraving, embroidery sampling and card crafting. A special thanks to all those who brought and demonstrated their skills. I got the impression that there was almost too much choice and not enough time. I'm sure that popular demand will ensure a return session. Now that this year's birthday photo has been uploaded to the web site for all to see, I must point out and thank the wonderful Sharon. She is in the middle of the picture and supplied not one but two delicious birthday cakes! Unfortunately our scheduled speaker was unable to attend the meeting today because of work commitments. We made the most of our free session by catching up on each others news. Lise, having missed last month when we were talking about 2 special dogs: hearing dog Yogi and medical protection dog Toby, took the opportunity to tell us all about her talented King Charles Spaniel called Dahey. She is training him to assist her in lots of activities of daily living such as fetching objects and pulling light switches. It is noticeable to the group how much these canine companions do to boost the confidence of their owners - truly more than just special pets. We were pleased to see Kay back amongst us now fit and well. She shared a few words about displaying and selling her art through an online artwork store www.squidoo.com/workshop/learning-to-see-again-how-art-saved-my-life. She reminded us about how important art is to her and what a vital role it plays in her ability to live with her pain. Janet then gave us a short talk about a positive experience she had had when she decided to arrange a medication review through the Pain Clinic. She had found it to be most informative and beneficial. Next month is a craft session where any member of the group has a chance show and share their talents. If any one needs any raw materials supplied, please contact me via Kevin and I will see what I can do. Steve Beale then reminded us about how Yogi, his hearing dog, was equally responsible for turning his life around and giving him back independence and enhancing his enjoyment of lif. We were very lucky to grab Richard Beale who, despite being just back from China with jet lag and mounds of pending paper work, was still willing to come and talk to the group. This time we were regaled with stories of North Korea and it was truly fascinating. What an interesting insight into the life and work of people in such a closed country. It's even called the "Hermit Country". I had no idea that you are not allowed to visit this country if you are from South Korea and if you are from the USA you are not allowed on their trains. You are also not permitted to take computers, mobile phones, GPS's in - it's difficult now a days to imagine a country where these items are not widely available. Despite these restrictions, Richard was able to describe a country rich in its own traditions filled with people who are contented and make the most of what they have. As always, I can't wait to see where Richard goes next and to hear more tales of his travels. Dorothy suggested that we should hold regular bring and buy sales. To try this out, she suggested bringing any books and bags that members are willing to sell to the next meeting to raise funds for our rent. Not a lot to ramble about this month other than to say that we had 2 very enjoyable events: the Christmas Meal at Haskins and the Christmas Party at the church hall. Thanks to everyone who contributed the time, food and company to make these occasions such fun. I am looking forward to the ongoing support of this wonderful group of people in 2012. Photo of endorphin, pictured on the left, kindly provided by Dennis Kunkel Microscopy, Inc. Image copyright Dennis Kunkel Microscopy, Inc. (www.denniskunkel.com). "Wellbeing" loaf which Mr Cotton sells in his shop. (Click here for information) It is full of healthy grains and seeds and is additive free. December 19th - Christmas Party! Why not come and join us for a coffee and a bun. Please Note: Keeping Pace With Pain now collects used postage stamps for Hearing Dogs for the Deaf. 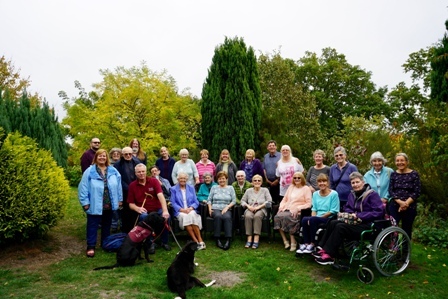 The group enjoyed an autumnal visit to Furzey Gardens and House. A lovely time was had by all. Many thanks to Furzey Gardens volunteer, Anne who made our visit extra special. Animations telling some of our pain stories, made by the very talented students from the Occupational Therapy Department of the University of Southampton along with 3 of our group members. Donate to charity for free. Every day go to The Hunger Site and click the special link on the homepage, its prominently displayed sponsors donate a cup of staple foodstuff to someone starving. Once you have clicked on that site visit the other sites listed at the top of that page and do the same.